"I'm all about the work and that bass. No treble." Hey, everybody! Gather 'round, because you know what time it is. It's time to meet the Angry Reader of the Week, spotlighting you, the very special readers of this website. Over the years, I've been able to connect with a lot of cool folks, and this is a way of showing some appreciation and attention to the people who help make this blog what it is. This week's Angry Reader is Ken Jeong. 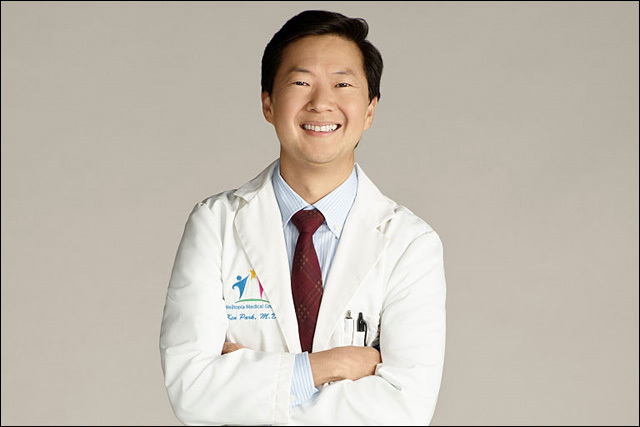 I'm Ken Jeong, an actor who used to be a doctor. Born in Detroit, Michigan. Grew up in North Carolina. Did my residency in New Orleans, and now living in Los Angeles. I'm currently working on my show Dr. Ken on ABC, season premiering tonight at 8:30p/7:30c. It's been a labor of love. Dr. Ken is loosely based on my life, but it's evolving into something more. Dr. Ken is normalizing Asian-American family life. Margaret Cho (All-American Girl) plays my sister in an episode and Will Yun Lee (The Wolverine, San Andrea") plays an ex-boyfriend of my wife, brilliantly played by Suzy Nakamura (Go On). The rest of the cast is incredible. Krista Marie Yu (The Thundermans) plays my daughter Molly and steals every scene she's in. Albert Tsai, best known as Bert from Trophy Wife is a national treasure. Jonathan Slavin (Better Off Ted) and Kate Simses (Mixology) are incredibly nuanced actors who crush every take. Tisha Campbell-Martin ("Gina" from Martin) and Dave Foley (Newsradio and Kids In The Hall) are icons who I am proud to call my friends. I'm all about the work and that bass. No treble.